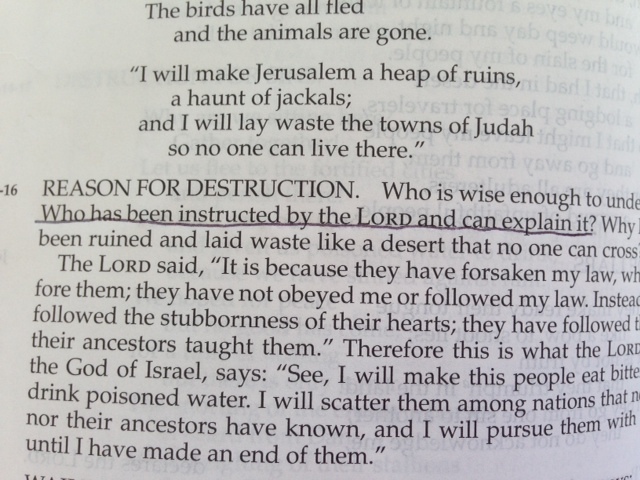 “Who has been instructed by the Lord?’ asked Jeremiah in his 9th chapter. How many of us seriously consider where our instruction is coming from? Is it coming from TV? Do we believe everything we hear on the news or on the internet? Do we quote these things to others like it’s verified fact? Is our instruction coming from family or friends? Our boss? If so, where are they receiving their instruction? Or is it all about what I ‘think’? Where did that instruction come from and what is it based on? We also need to consider how Satan is constantly trying to give us directions. He and his pack prowl around us waiting for a weak moment where they can ‘instruct’ us in how to rationalize our bad behavior. Satan gets a big smile on his face whenever we seek instruction from any source other than God. God tells us to use his infallible word for our instruction and to compare everything else to it in order to discern if the other thing is true or false. As we read and study God’s word, he instructs us. And there is always more to know – that’s the lifelong journey towards the truth that we’re on. I think it’s great that you are all on this journey with me and that you read the thoughts and meditations God gives me. It is my prayer that you are also reading God’s word yourself so that God can speak directly to you and instruct you. Thank you for your amazing and living word to us, dear Father.